I have never been much good at this holiday lark. I can manage the logistics of travel, and I do not suffer from any illusion that the world’s continuing rotation depends on my being at my desk. I can flit off without a qualm if the destination is a foreign conference, but disappearing voluntarily is a different matter. I blame the Protestant work ethic in which I was brought up, then on being a law firm partner just at the point in the 1980s when we moved from having drinks before lunch to missing lunch altogether, and, finally, on several years of running a business involving software support which really did depend on my being available. What I do now in fact has few geographical constraints thanks to the BlackBerry and the ubiquity of broadband. It is, I begin to realize, no bad thing to give the brain a rest from time to time. It is never the right time, of course, but the back-to-back conjunction of an unexpected opportunity to borrow a house and two commitments (simultaneously pleasurable and inescapable) took me out for two weeks notwithstanding my backlog. I should have been in Hong Kong, speaking at the LexisNexis e-discovery conference there; they got HHJ Simon Brown QC in my place, which will not have upset them at all. I had to break off a mind-stretching correspondence with a US commentator about the implications of a particular US Opinion which filled the closing moments before I left. A white paper was part-done when I went away; I took it with me in the vain hope of finishing it off, but it will be the better for having been unopened for a fortnight. The end of the legal term brings a last chance to plan what we can do to help judges when they return in the Autumn – an Autumn which will bring Lord Justice Jackson’s report on litigation costs and, I suspect, a post-Digicel shake-up (yes, I know that Digicel v Cable & Wireless was last year, but I would put money on its true effect coming through at the end of this year). Submissions to Sir Rupert Jackson are due at the end of July. A new draft disclosure rule hit the wires a couple of days ago, with the same deadline for comment. The joy of the BlackBerry is that correspondence like this and with sponsors, would-be sponsors, and others can tick over without impairing the quality of the break. Besides, there is always something relevant to dig out of any experience, whether it is some application of technology, an international link of some kind or just a cultural reference which fits (albeit with some stretching) within the ambit of my self-defined brief in these pages. We began with a few days at a very big house in the country. Well, not at it exactly, but in a lodge in its grounds which some friends kindly lent us. 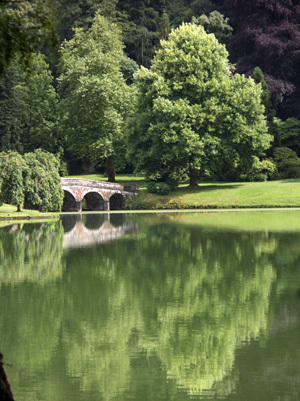 The house was Stourhead, an 18th Century Palladian mansion in Wiltshire famed for its gardens, with temples and monuments around a beautiful lake. Ambitious plans to use it as a base for rural tours were never quite fulfilled, although we did go for Sunday lunch with Nigel and Amanda Murray at their new house near Salisbury Plain. 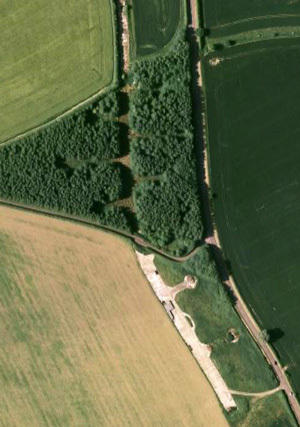 One of the features of Southern England is the number of wartime airbases – the briefest wander across the landscape with Google Earth shows their traces. There was one at Stourton, betrayed by what was clearly a perimeter track and, on closer inspection, the evidence of hangers and dispersal points. 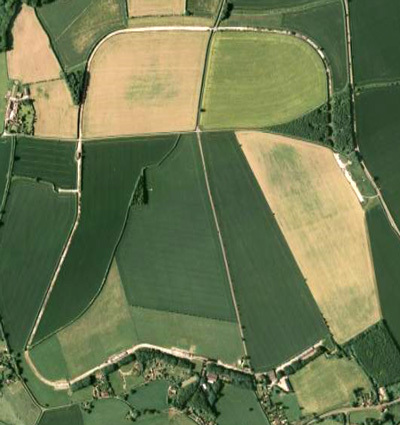 The base, known as Zeals Airfield, was occupied in turn by British, Canadian and US forces. The latter, with that distaste for half-measures which characterises US forces in every war (including litigation), found the base inadequate for their needs. They laid mesh runways over the grass and built proper quarters where the RAF had used the grass and lived in tents and local accommodation. Nothing much changes – the news this week was full of complaints that British forces in Afghanistan have inadequate helicopter support compared both with their operational needs and with US forces in the same war zone. The Prime Minister assures us that those we have are adequate, in much the same tone as he tells us that public spending will continue unabated and that he chose his own Chancellor. On next to my Mother’s 80th birthday in Orford in Suffolk, a major logistical and catering exercise. My second son, Tom, volunteered for all the jobs which allowed him to watch the cricket as England beat Australia at Lords for the first time in 75 years. There is an uneasy relationship between cricket and technology which, if it does not exactly match the impact of technology on discovery, does so at least to the extent that technology uncovers things which would otherwise stay hidden. At least three Australian wickets were shown fairly conclusively, by slow-motion and hot-spot technology, not to have fallen at all. But if you had to watch that catch-which-was-not-a-catch twenty times in slow-motion to be reasonably sure that the ball bounced before reaching the fielder’s hands, then who can blame the umpire for giving the batsman out? The near-parallel in discovery lies in the fact that technology could find every relevant document and discard every irrelevant one if you used it to the nth degree, but justice which costs that much is not justice at all, as Lord Justice Jacob pointed out in Nichia v Argos. The Australian dismissals may have been “rough justice” (to use Jacob LJ’s phrase from Nichia) but the game kept going. There is another parallel here, of course. We gave the rules of cricket to the world, just as those for discovery came from us (what is it about all these activities which seem to take for ever?). The rest of the world has been rather better at cricket than we have of late, and has handled discovery differently (if not necessarily better) from our way. Perhaps this is the year when England reclaims both. The fourth Test starts at Headingley on 8 August and Tom and I have tickets for the last day. Leeds was the final leg of our tour, for the graduation of our eldest son, Charlie. I have never seen a graduation conducted in English before (mine were largely in Latin). It provided one of two illustrations of the arts/sciences divide which turned up that day and which have a bearing on my main subject – the failure by lawyers (hailing from the Humanities side) and the technologists (seen as representing science) to make any impression on the other. Two groups were taking their degrees at the ceremony, those who had read music (including Charlie) and the Earth Sciences students. Some old buffer was given an honorary degree to add to the many academic garlands and the peerage which his scientific work had already earned him. I am sure he deserved them all, but his attitude illustrated why so many of us would rather fry or drown than listen once more to some Green prophet of doom. Music is all very well, he sneered, and perhaps the new music graduates could play something soothing whilst the scientists struggled to save the world. Listening to him, I wondered if having the manners not to rain on someone else’s parade is one of the factors which differentiates artists from scientists. Like a socialist politician, whose claimed concern for the masses never quite translates into a benefit for any identifiable group, this man’s obsession with the fate of the world blinded him to those immediately in front of him who had just collected the degrees he mocked. By chance, the role of the arts in society was the subject of a BBC programme that night which explored the possibility that hard economic times might foster the arts. It began with a history of the Roosevelt–led Works Projects Administration, or WPA, which funded not just roads and dams and public buildings but drama, writing and similar purely artistic projects. One of the contributors observed that old civilizations were remembered by the output of their artists rather than their politicians. The second part of the programme will apparently examine whether British arts might thrive similarly in the present recession. I somehow doubt it – a philistine government, obsessed with bureaucratic control (the ludicrously clumsy and expensive Arts Council, for example), and unable even to equip our soldiers properly for a war which it began, is unlikely to fund initiatives in the Arts. I will have to pay for Charlie’s post-graduate studies because the money which used to be allocated for such things is going instead to provide circuits for muscle-bound oafs to run round in 2012. What has this to do with disclosure? The law remains a profession of the Humanities, whose critical, philosophical and analytical elements edge out science and technology. Many lawyers despise technology and its proponents in much the same way as the scientific professor in Leeds despised music and musicians, according it a bit-part in the lofty ideals and aspirations loosely gathered under the heading “justice”. We need a closer meeting of minds in both areas. I might take a bit more notice of the doomster scientists if they would learn some manners, shake the twigs from their hair, clean their sandals, and wash occasionally. They might also benefit from learning that their science must be explained in terms which the rest of us can relate to, not just declaimed from street corners as a self-evident good. Those who offer technology solutions to lawyers must similarly learn the language of the audience whom they seek to influence. We are all in this together. The legal profession is going to Hell in a handcart if you accept a fraction of Professor Richard Susskind’s analysis, in much the same way as the scientists predict for the globe. The role of the arts and the sciences is reversed in this scenario, but the technology is offering more than soothing music to die to. One last, if rather stretched, analogy from our tour. The pubs in which we ate and drank all had old-fashioned traditional names – the King’s Head, the King’s Arms, the Spread Eagle and so on. There has been a trend in England for brash new corporate owners of pubs to give them names aimed at attracting younger high-spenders. The Osney Arms in Oxford, for example, became ‘Walter Mittey’s”, the owners not merely contemptuous of the history which they inherited, but too ignorant to spell correctly the American cultural icon whose name they imported. The Osney Arms is one of two pubs in Oxford which have reclaimed their old names and appear, outwardly at least, to be thriving. Those who drafted the 1999 CPR thought it would be daring and symbolic to rename the ancient process of discovery, as if hoping that by giving it the fancy new name “disclosure” they would revolutionise its practice. They would have done better to have devoted more attention to the practice itself. The relabelling was a pointless fad, as useless as giving an old pub the name of a fictional fantasist. It not only put us out of step with the rest of the common law world, but implied that the providing of one’s documents to opponents (the disclosure) was more important than finding out what you have got (the discovery). There was an element of fantasy anyway in a 1999 set of court rules which, save for one reference, ignored technology completely. If the rule-makers think that tampering with the label really makes a difference, then perhaps they would tamper it back again to send the message that the courts are out to discover what documents you have which really matter. 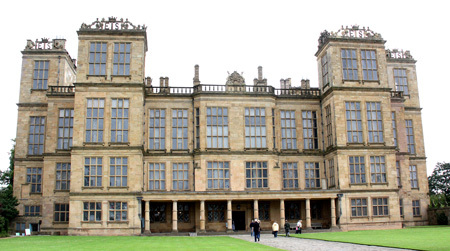 The last stop on our recent peregrination was Hardwick Hall in Derbyshire. 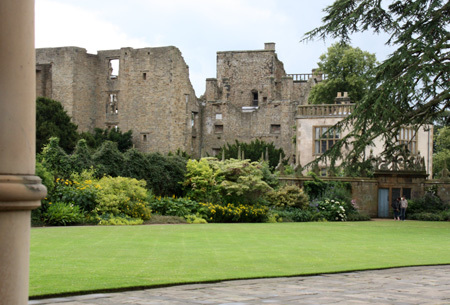 The Countess of Shrewsbury, familiarly known as Bess of Hardwick, started remodelling her family home in 1587 when she was 60, adding wings and elaborations. She finished it, on a grand scale, in 1590 and, dissatisfied with the result, almost immediately began building a new house next door which took seven years to build. There are those who argue that we should adopt much the same approach with the CPR, and start all over again. I am not amongst them. We might usefully chop off some of its wings and elaborations, but a better approach would be to implement properly what already exists. Now I am back, I can take up that battle again. This entry was posted in Case Management, Civil justice, Court Rules, CPR, Discovery, eDisclosure, eDiscovery, Electronic disclosure, Judges, Litigation Support. Bookmark the permalink.